Sushi is always a good option for eating out; it’s also fun to make at home and I like to change things up like in these spicy shrimp sushi stacks. 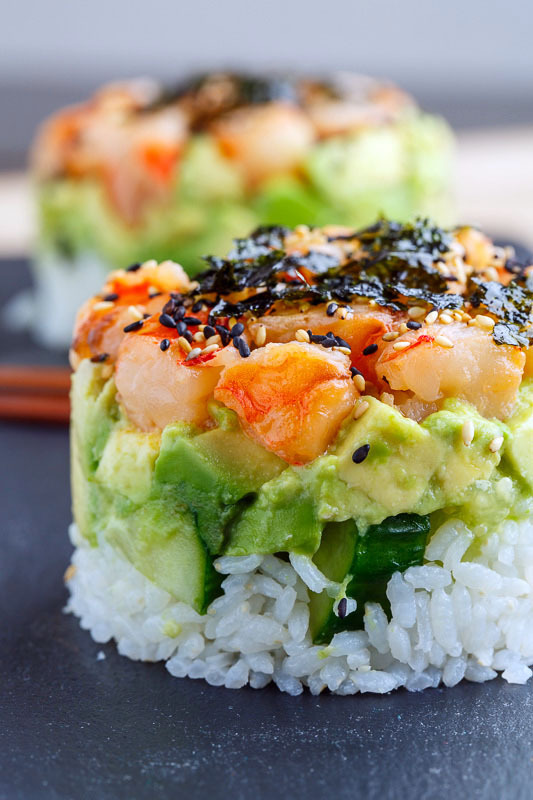 This is a really simple change up on sushi where all of the flavours of a sushi roll are served in a stack, in this case a spicy shrimp sushi with avocado and cucumbers. This recipe starts off with sushi rice which is a short grained rice, which when cooked gets sticky, and it’s seasoned with a touch of vinegar, sugar and salt after cooking. The next layer is a cool and creamy avocado and cucumber layer with diced avocado and cucumbers seasoned with lime juice and salt. The final layer is the spicy shrimp with large chunks of cooked, diced shrimp mixed up with mayo and sriracha chili sauce. The trick to stacking these nicely is to use a circular tube where you place one layer in and pat it down before placing the next layer in. You can buy circular cookie cutter like cylinders specifically designed for this or you could just wing it like I do and use an empty tin can (like a soup can) where you remove the top and bottom. I also like to use a 1 cup measuring cup where I lightly oil it, push each layer down into it and then flip it onto the plate before sliding the cup off. I like to make these with cooked shrimp but feel free to replace it with raw tuna or salmon, etc. This spicy shrimp sushi stacks is sure to impress at you next get-together! 0 Response to "Spicy Shrimp Sushi Stacks"